So much hinges on the preliminary injunction the NASL has requested from the court. A hearing for the injunction will be held in Brooklyn on October 31st, and a decision is anticipated within a few weeks. If NASL is granted the preliminary injunction, watch for the league to put an aggressive expansion plan in place that will see it eclipse 12 teams in 2018. There is a lot of work going on behind the scenes right now to ready additional teams for next year. Should the court’s decision go their way, we will see a very different NASL lineup in 2018 than we did in 2017. The preliminary injunction also impacts the launch date of NISA. If NASL is granted the injunction, NISA probably pushes to July 2018 or Spring 2019. If the injunction is denied, then NISA becomes the prime landing spot for most NASL teams, pushing forward with the Spring 2018 season. NISA is waiting until mid-November to seek sanctioning, which happens to be around the time when the court’s decision on the injunction is expected. This is not a coincidence. 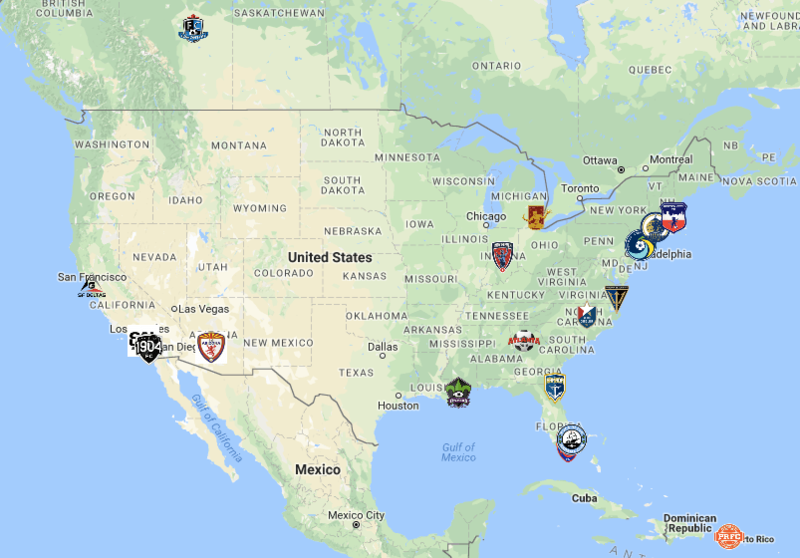 In a scenario in which the preliminary injunction is granted, we should expect to see the following teams return to the NASL: the New York Cosmos, Miami FC, Jacksonville Armada and Indy Eleven. The other four existing clubs have some question marks, but all four could return. North Carolina FC may still look to USL in this scenario. Puerto Rico FC has a lot to overcome with the storm damage to the island, but there has been no indication that they will not return for 2018. Common sense just dictates it might be a tough road. FC Edmonton is likely to go to the Canadian Premier League at some point in the near future. If the NASL is around and the CanPL delays its start until 2019, expect the Eddies to be back for an NASL swan song in 2018. They are not going to USL, as their owner, Tom Fath, told Steven Sandor of the11.ca earlier this year. The San Francisco Deltas are perhaps the team most unlikely to be back next year, at least with their current ownership. Midfield Press understands that NASL owners are prepared to help several ambitious NPSL clubs make the leap to the pros by temporarily financing them until long term investors can be found. Soc Takes reports the NPSL clubs with Letters of Intent to join NASL for 2018 to play in the case of the preliminary injunction being granted are FC Arizona, Boca Raton FC, Boston City FC, Detroit City FC, a Hartford team and Virginia Beach City FC. HartfordBusiness.com confirmed the Hartford team is Hartford City FC of NPSL. Midfield Press understands work has been underway for several weeks to help prepare these clubs for a professional launch in 2018. 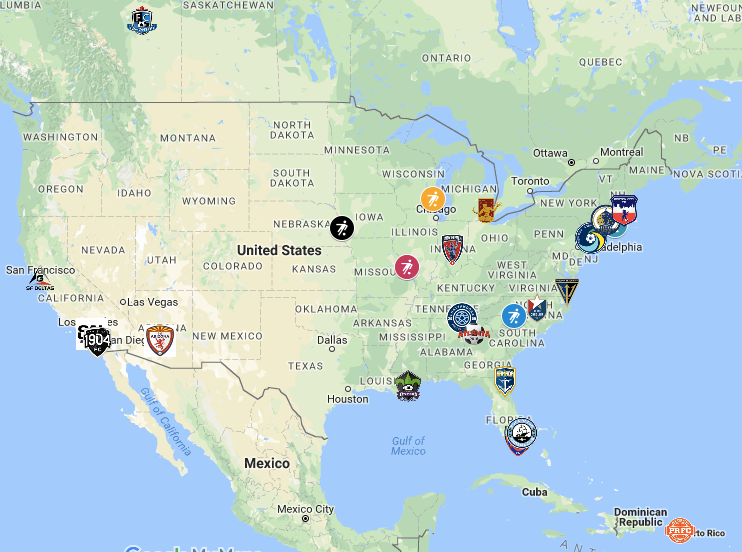 These expansion clubs would join the already confirmed California United FC and San Diego 1904 FC, as well as the Atlanta 2018 group, to provide NASL with nine new clubs. While having one owner fund multiple teams is against the current Professional League Standards, the protection of the preliminary injunction could provide NASL the leeway to make their numbers up in a way that USSF’s rules will not normally allow. This move by NASL owners would not be without precedent. In its early days, at a similar phase of development, MLS had 3 owners running 10 teams. This also gives context to Sunil Gulati’s email comment published in the USSF response to NASL’s lawsuit filing that NASL prove it has 8 “separately owned” teams for USSF to offer to reconsider its D2 status. Having league/owner funded teams and finding them investors is a formula that has worked in the past in both NASL and MLS. NASL successfully transitioned league owned/run clubs in Minnesota, North Carolina and Jacksonville into finding those teams investors. While not a successful transition, the league also initially engaged with its current prospective Atlanta ownership group while trying to do the same for the Silverbacks. It is unclear if the league will be willing to fund the San Francisco Deltas franchise in addition to several owners supporting the NPSL teams. They may not have the appetite to support a seventh team, but at the same time, the Bay Area is a large market coveted by both the NASL and USL. Rumors are abound that the Sacramento Republic may be eying up Oakland for its affiliate team should it make it to MLS. If NASL decides it wants to maintain a foothold in the Bay Area, it may make sense to move the franchise across the Bay to Oakland, and rebrand the club. A league run Bay Area club would keep one of the nation’s top media markets securely in the NASL camp while the league seeks long term investors for them. At the center of the NASL’s plea for injunctive relief are the USSF Professional League Standards, which require a Division II league in its sixth year to have teams that meet the time zone requirements, as well as playing in a Metropolitan Statistical Area (MSA) of at least 750,000 people, play in a stadium that has a minimum seating capacity of 5,000 under lease, and have a principal owner (35%) with an individual net worth of at least $20,000,000. Currently, Boca Raton FC (Broward College South) and Boston City FC (Brother Gilbert Stadium) do not play in venues that meet the criteria, and would have to relocate to meet those standards. However, there are suitable venues in those markets, such as FAU Stadium in Boca and Nickerson Field or Harvard Stadium in Boston. FC Arizona (John D. Riggs Stadium), Detroit City FC (Keyworth Stadium), Virginia Beach City FC (Virginia Beach Sportsplex) are all beyond minimum capacity in their current venues. It is assumed that because of their bid to play at Dillon Stadium, Hartford City FC would also meet that criteria, should they be accepted into the league. However, beyond the infrastructural needs for the team, are the financial requirements of ownership in the league. Without a full financial disclosure, it is difficult to discern if the proposed NPSL teams’ ownership groups meet that standard, plus three years of operational capital. Midfield Press has been informed that league owners Rocco Commisso, Riccardo Silva and Robert Palmer plan to financially assist two NPSL teams each beyond their primary clubs, and that certain fees for those clubs may be waived. We are told that the manner of financial assistance still leaves the NPSL club owners’ ownership stakes fully intact. With all that being said, the possibility exists that if Judge Margo Brodie rules in favor of the NASL, all those standards could be removed. In addition to the NPSL teams reported by Soc Takes for 2018, the New Orleans Jesters have signed a letter of intent to join the league per the NASL’s lawsuit filing. The Jesters ownership group is understood to have sufficient wealth to meet the Division II standards and is not thought to be in need of support from the league or its owners. However we understand they could take advantage of some incentives in terms of fees if they join for 2018, rather than 2019 as planned. Of the 8 NISA applicants, most are ready to go for 2018 according to Peter Wilt. While Chattanooga FC has said it plans to wait until 2019 to launch its pro team, we understand that St. Louis, Miami United FC and Connecticut are among the clubs that could be ready to launch in 2018. It is not certain where Charlotte FC, Omaha and Milwaukee stand in this regard, though Wilt’s comment that “most, but not all, of the applicants are ready to move forward for a 2018 launch” means a minimum of five out of eight should be ready. It should be noted that Connecticut NISA and Hartford City FC NASL are not the same bid. Midfield Press understands the Connecticut NISA group is planning for a long term future in different part of the state. In a scenario where NASL is not granted the preliminary injunction and stops functioning as an active league, it is reasonable to assume that most teams with independent ownership groups would join NISA. North Carolina FC is the only club that seems very likely to head to USL in such a scenario, due to their heavy investment in the bid for one of the four MLS expansion slots available. Several clubs could fold. Rocco Commisso has made it clear it is Division II or bust for the Cosmos. This would mean that NISA would likely have to get Division II sanctioning for the Cosmos to join it. As a first year league, the bar for Division II is lower than for NISA than it would be for NASL. NISA would need 8 teams, in two time zones. 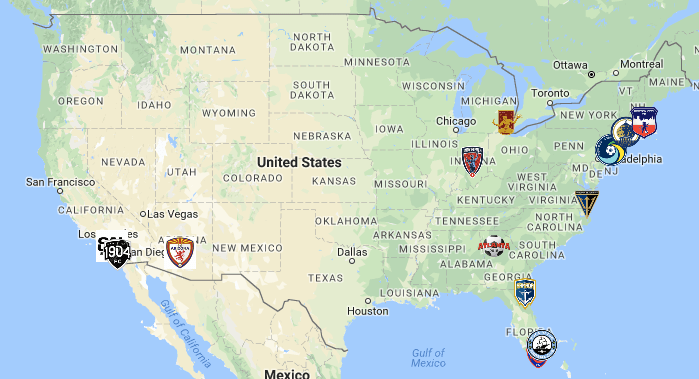 Take the five or so teams ready to go for NISA, and add the Cosmos, Miami FC, Jacksonville, Indy Eleven, California United, San Diego and Atlanta to the mix, and there are 12 teams before considering what might happen in Edmonton, Puerto Rico and the San Francisco Bay Area. From there, NISA and Club 9 Sports could assist the NPSL clubs that would have been funded by NASL owners in the “NASL survives” scenario, in finding investors to join as soon as 2019. Should a few of the NISA ownership groups or venues not meet DII standards, those clubs could play a year in NPSL and join a NISA third division league that launches in 2019. There are a lot of moving parts here, but the chances of ONE of NASL or NISA playing in 2018 are very high. The chances of both playing in Spring 2018 seem fairly low. The fates of the 2018 NASL and NISA seasons appear to be very much intertwined. Perhaps what is most important is that the NASL clubs appear to have a safe landing spot, one way or the other, should their ownership groups elect to take it. If the NASL survives, it will need to decide on its long term strategy. Before it stand the options of continuing to operate as a closed franchise model, or merging with NISA to join in its vision of an open pyramid system more similar to the global standard. At the time of publication, Midfield Press has not received any official response from the NASL on the contents of this article.